The GHRC DAAC mission is to provide an archive of both data and knowledge services with a focus on hazardous weather, its governing dynamical and physical processes, and associated applications. Within this broad mandate, GHRC will focus on lightning, tropical cyclones and storm-induced hazards through integrated collections of satellite, airborne, and in-situ data sets. 1) An archival interest form that allows a data producer to provide basic information about their dataset to the DMG team, and 2) A data product questionnaire in which data producers provide all important metadata and information to DMG for dataset publication. Behind the scenes, the Data Product Submission Portal is used by the DMG to push a data set through the data publication process. A data producer can use the tool to monitor the status of their data set. What are the Benefits of Data Publication at GHRC? A vital part of science is reproducability of results that lead to community confidence in findings and conclusions that advance scientific knowledge. Essential for the reproducibility of results is proper curation of the data used to draw conclusions. In order to publish your findings, more and more journals are requiring evidence of data archival at a long-term facility. GHRC provides this service and meets these requirements. The entire workflow of dataset publication at GHRC from accepting it for archival to publishing it to the end user is managed by the GHRC Data Publication Portal and associated Data Publication Portal used by the GHRC DMG. The portal provides a centralized system for Data Producers to provide dataset details, for GHRC DMG and GHRC DAAC Managers to push the dataset through the stages of publication, and for the GHRC DMG to interact with the data producers about the datasets. The portal automates many of the steps required for dataset publication to reduce redundancy and repetition of effort, and to speed the overall process. Data providers can monitor their submissions as DMG works toward data publication. When you submit data to GHRC, you agree to work with the team in a timely manner to assist with the process of data publication. You may contact GHRC at any time during the process using this data product submission portal. 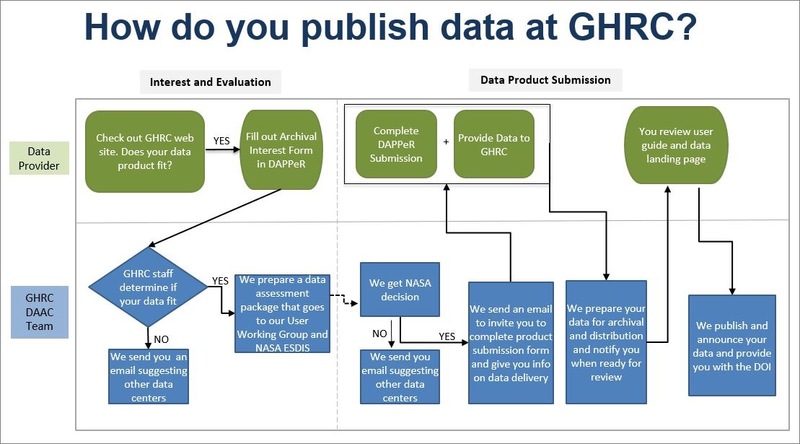 This detailed workflow chart shows how the GHRC ingests and publishes your data through various stages, what team members handle your data and what your responsibilities are to the process. Step 1: Complete and submit the Archival Interest Form (click on "Get Started" button below). Step 2: When you obtain the news that GHRC is interested in publishing your data, complete and submit the PI Questionnaire Form. If you have any questions, you can use the portal to contact the DMG during the process. Step 3: Submit your data following the instructions provided to you by the DMG. Step 4: The DMG will next catalog and process your data, write documentation to support your data, and create browse images of your data if necessary. We will contact you if there are any questions. Step 5: You will be contacted by the DMG for feedback on the documentation produced. Let the team know as soon as possible that all is well. Step 6: The DOI and dataset landing pages are generated and activated as your dataset is published at the GHRC DAAC. At this point you can refer others to the public data and provide the DOI to journals as needed. This form contains multiple tabs containing questions gathered by topic. Data producers are required to complete most questions in order for the publication process to occur. There are help icons that provide additional guidance if needed.